Much like the response to Hurricane Maria, the Vietnam War raised questions of colonialism for Puerto Ricans, while also fueling their struggle for independence. This week, as Puerto Ricans feel once again like a White House afterthought, it is hard not to conclude that Puerto Rico matters to Washington only when mainland political and business leaders need to conscript the island itself for some larger financial or military purpose. Consider the impact of Vietnam War policy on Puerto Rico. Thanks to a new Ken Burns documentary and Hurricane Maria, the headlines have us talking simultaneously about Vietnam and Puerto Rico for the first time in 50 years. Today, few Americans remember the impact of the Vietnam War on Puerto Rico. Yet the war struck the island with the force of a political hurricane, tearing at Puerto Rico’s social fabric, raising the same questions of colonialism that are again in the news in the wake of Maria, and fueling its independence movement. Not unlike Puerto Rico’s recent fiscal crisis, the Vietnam War brought into sharp relief the island’s unequal status as a territory of the United States, particularly after President Lyndon Johnson escalated the war in 1965. Draft-age men in Puerto Rico were subject to the Selective Service Act and called for induction into the U.S. military — even though they had no representative in the Congress that passed the Gulf of Tonkin Resolution, and even though many did not speak English. 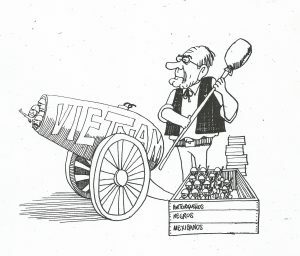 A political cartoon published by Claridad in August of 1968. One week later the MPI called on Puerto Ricans to resist the draft and condemned American aggression in Vietnam as a guerra sucia — a “dirty war” — against “the heroic people of Vietnam.” In response, students for the first time protested outside the Selective Service’s offices in San Juan. For the MPI, the draft represented a “blood tax,” a “taxation without representation” that Americans aware of their own revolutionary heritage should have understood. Independentistas pointed to the composition of local draft boards (which were called “juntas” in Spanish) as proof. According to Selective Service Director Lewis Hershey, draft boards were “little groups of neighbors,” best suited to look out for America’s sons. But the MPI complained that the local boards were made up of “members of the richest families, statehood proponents … members of the Lions Club, Rotary, Exchange, Citizens for State 51 and other fiends” who “funneled” the poor into the military. These draft board members were Puerto Rican mandarins, agents of the colonizers. 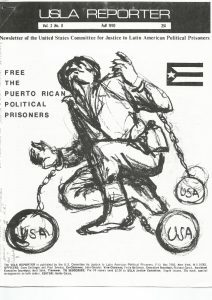 An image published in the Fall of 1970 by the U.S. Committee for Justice to Latin American Political Prisoners. In 1965 and 1966, long before a coordinated draft resistance movement took shape stateside, 33 members of MPI and two others refused to be inducted. Prosecutors indicted them promptly. When they went to trial in federal court, the proceedings were conducted in English — which often meant that some of the best Puerto Rican lawyers were unavailable — and if one wanted to appeal a conviction, the appeal was heard 2,700 miles away, in Boston, also in English. 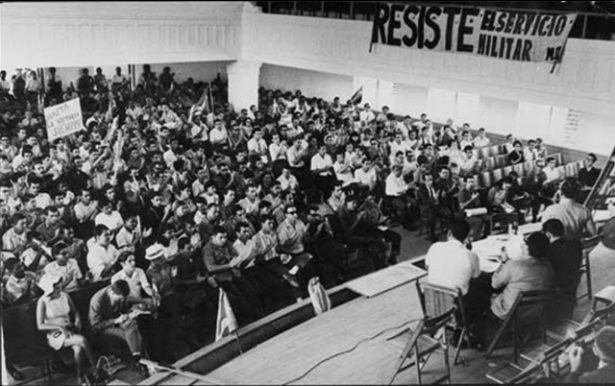 In August 1966, the first Puerto Rican draft resistance case, that of Sixto Alvelo Rodriguez, came to trial. Alvelo won support not only from the MPI — which enlisted the radical New York law firm Rabinowitz, Boudin, and Standard for his defense — but also from mainstream supporters who formed Comite de Defense Sixto Alvelo. More than 200 students signed a statement in support of Alvelo, pledging that they, too, would refuse induction. In September, the court asked Alvelo’s draft board to re-induct him (it never did) and dismissed his case and all other MPI draft resistance cases. The independence movement interpreted the court’s ruling as a major political victory. The MPI speculated that Alvelo’s case revealed “one of the most tyrannical manifestations of our colonial subjugation” and that Washington had backed down in the face of the threat of thousands of induction refusals in Puerto Rico. At the same time, however, the Selective Service continued to call Puerto Rican men for induction, and support for the draft resistance movement continued to go mainstream. On Mother’s Day in 1967, Puerto Rican mothers organized a protest against the draft in San Juan. The Puerto Rican Bar Association passed a resolution in 1968 calling for the exemption of Puerto Ricans from compulsory U.S. military service, and one year later, the Puerto Rican Episcopal Church passed a resolution at its Diocesan Convention condemning both the war and the conscription of Puerto Ricans. In the end, Puerto Rico’s draft resistance did not end the Vietnam War nor did it win independence. But it did help to prevent further escalation of the war in 1968, and it brought many Puerto Ricans both to the antiwar movement and to the cause of independence. Moreover, draft resistance in Puerto Rico combined with draft resistance throughout the United States to compel the Nixon administration to introduce a draft lottery and, ultimately, end conscription altogether. Protest against the draft in Puerto Rico and throughout the United States worked because it targeted an institution that few could defend as fair. Today, with the federal government seemingly unable to deliver post-hurricane relief to Puerto Rico in a manner equal to its assistance in Texas and Florida, we have yet one more example of discrimination against a people who right now need only compassion, sympathy and generous aid. 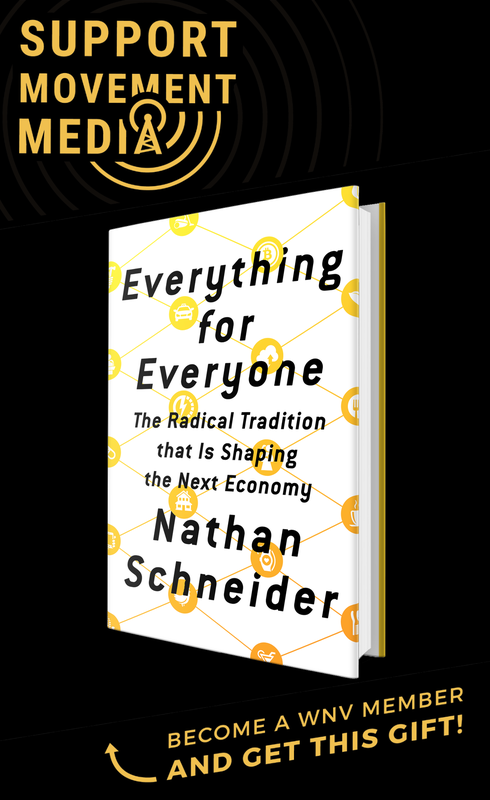 The devastation of Puerto Rico’s recent fiscal crisis (a crisis rooted in mainland lending policies) has now been compounded by natural disaster. It is in moments like these when, as during the Vietnam War, the second-class treatment of Puerto Rico by Washington is most obvious. The island itself has been treated as a conscript by successive U.S. governments for more than a century, for far too long. The question is how islanders will respond to Washington this time. Will they protest? If so, what form will the protest take? Now may be a good time, in fact, for Puerto Ricans (and for the rest of us) to look to the island’s resistance to the Vietnam War as a model worth following. Fifty years later, it is worth remembering the place of Puerto Rican draft resisters in the American tradition of dissent. And it is worth remembering its place in a tradition of resistance to American colonialism. 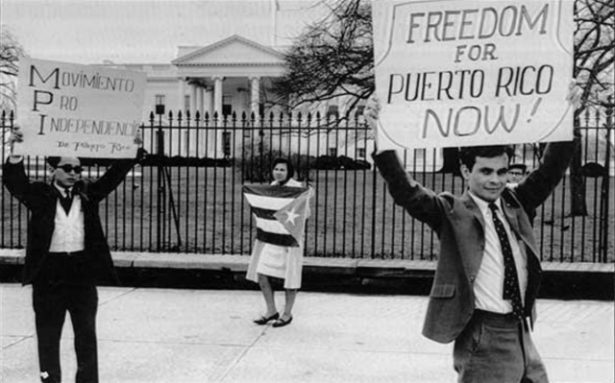 By escalating protest against the war and by risking their own freedom, Puerto Rican draft resisters kept alive the notion that resistance is a valid mode of citizenship. Michael Stewart Foley is author of "Confronting the War Machine: Draft Resistance during the Vietnam War." He is Professor of American civilization at Université Grenoble Alpes in France. Hunter College, New York City – Puerto Rico Collection may have books, articles indicating Puerto Rican nonviolence vs militarization from 1898. Thank you, Mr. Foley, for shining a light on an edifying chapter in history. I particularly enjoyed your use of “tradition” and “dissent” in the same breath. Nowadays dissent is not so much about standing for something as it is about stirring the pot for 15 minutes of fame. By extension, resistance, which as you pointed out is a “valid mode of citizenship,” is also confused with self-segregation along ideological lines.